Note: This is guest post DIY Submission from: Scott Wales (LTC, US Army, Ret.) and Derek Wales (1LT, US Army). When I created the DIY Corner in 2011 its sole purpose was to share how I was doing things in my garage, not to say THIS is the only way you should do it. 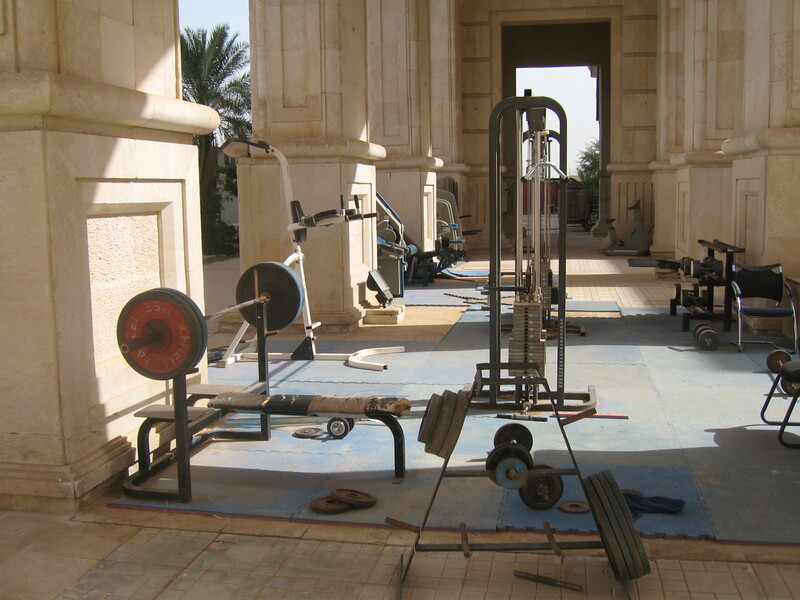 Now that End of Three Fitness is growing I would like to share how people like YOU are doing things. 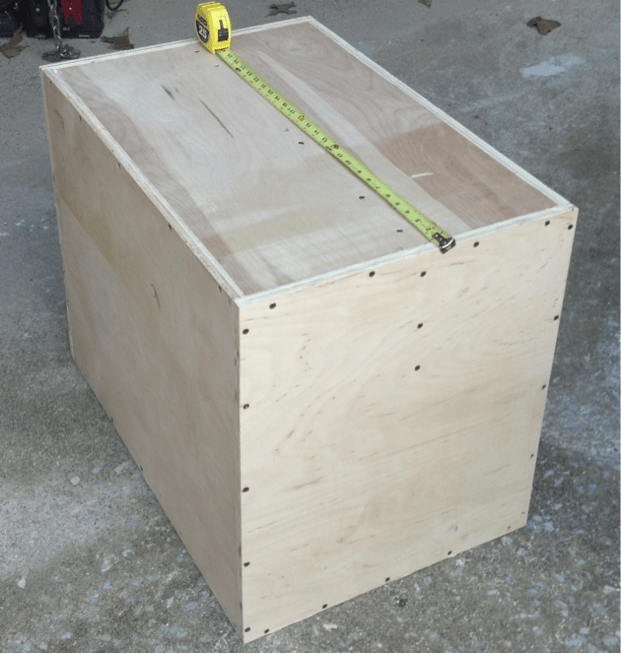 This is another Plyometric Box “how-to”, to compliment the original “How To Build A Plyometric Post” (the most popular post of all time at End of Three Fitness) submitted by Scott Wales (LTC, US Army, Ret.). 20” from the end of the sheet draw a line. Using the circular saw, cut along the edge of this line (towards the center of the sheet) so you have a piece that is 20” x 48”. This is Cut 1. Down the center of this piece, draw a line and cut this line so you have two equal pieces each 20” x 24”. This is Cut 2. This is Cut 3. 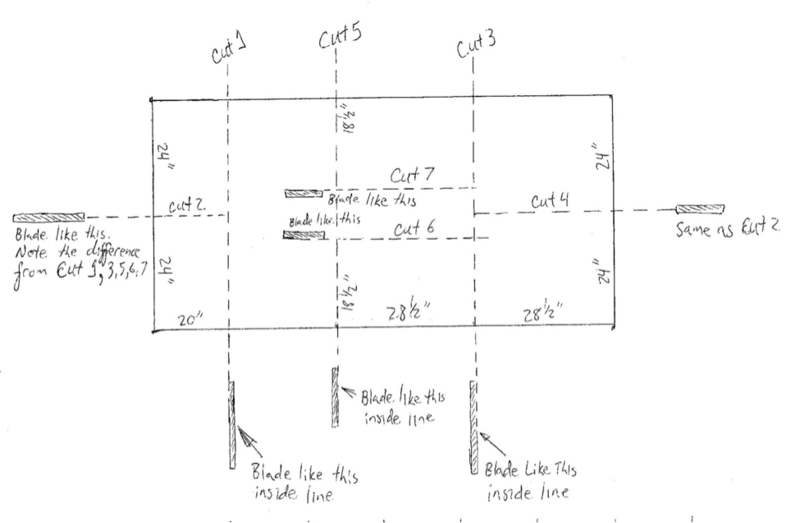 Down the center, draw a line and cut this line so you have two equal pieces each 28 1/2” x 24”. This is Cut 4. Next, working from the cleanest/straightest edge of the remaining sheet, measure a line 28 ½” from the edge, cut along the edge of this line so you have a piece that is 28 1/2×48. This is Cut 5. Draw two lines, each 18 ½” from each edge and cut inside each of these lines towards the center of the sheet so you have two equal pieces each 18 1/2” x 28 1/2”, plus a strip between them 11” x 28 1/2. These are Cuts 6 and 7. 28 ½” long, two of which are 24” wide, two that are 18 ½” wide, and one that is 11” wide. 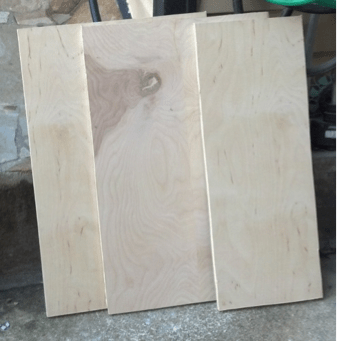 The first four pieces form the body of the box, with the two 20”x24” pieces as end caps. The 11”x28 ½” piece is used as a cross brace. 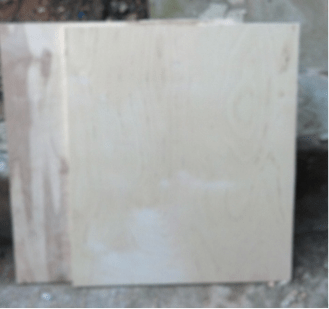 The top of the box in the picture is an 18 ½” x 28 ½” piece, but by surrounding it on all sides with ¾” ply, the total dimension becomes 20”x30”. Note where the tape measure lies on the top, and the line of drywall screws that follows it along the top and partially down the side. This is where the brace runs across the box. 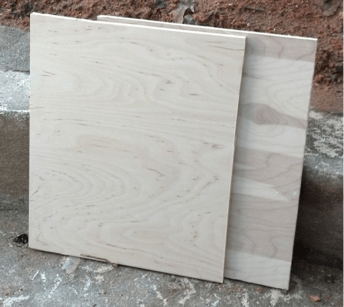 You can clearly see how the 20×24 piece is an end cap, and the 24×28 ½ piece forms the side. I highly recommend you cut handholds for carrying. The box is a bulky 60 pound beast without them. I cut handholds for carrying by tracing the outline of the holes on each of the 20×24 end caps and drilling out the corners of the outline and then using a jigsaw to finish cutting it out. If I had it to do over I would have cut these out BEFORE assembling the box, because I ended up having to stick a shop vac hose into the holes to clean sawdust and chips from inside the box. I then marked the three best landing areas with my name. For the top, I marked the face where the brace is, and picked the long edge with the smoothest fit. If you look very carefully you can see that the opposite long side of the top has a very slight lip. I picked the side with zero lip. I did the same on the 20×24 side, and the 24×30 side. 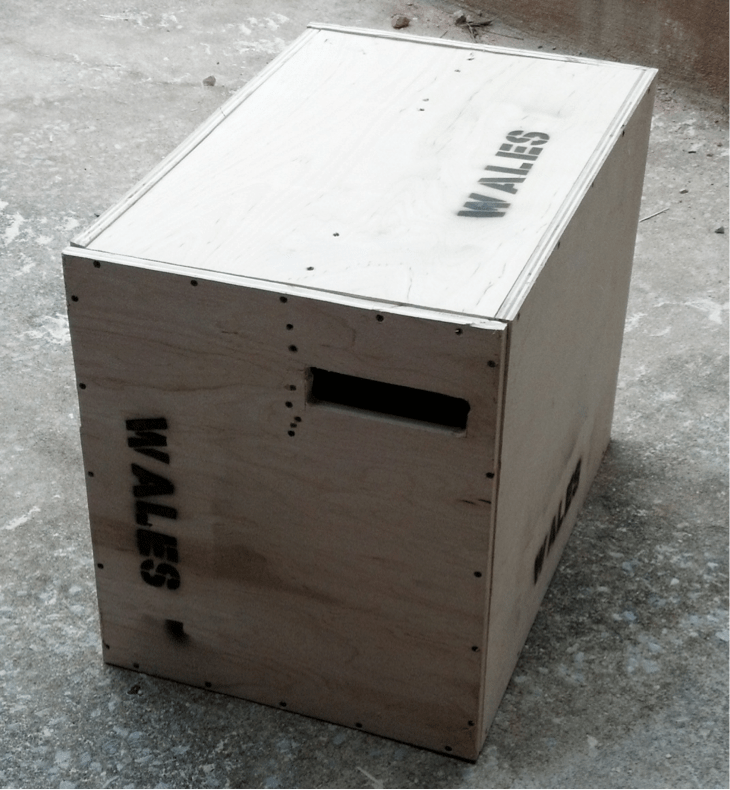 Now I have a completed box, where I flip it to the height I need and “aim for the name” when I jump. If you like this post help me by sharing it. Thanks!